Overnight Thursday: Cloudy, chance sprinkle. Lows around 40. Friday: Showers, highs in the 50s. We have one last day of brilliant sunshine Thursday before the air changes in New England. While the air will change for the milder, the clash of incoming warmth and pre-existing cool air will generate plenty of clouds and some occasional showers along the way. For now, the cool and dry air that started our workweek is moderating, and continued sunshine is mixing only with decorative high-altitude clouds Thursday. This will afford high temperatures just over 50 degrees. However, a steady southerly breeze will keep the wind chill values in the 40s. Nonetheless, a decidedly spring feeling is returning to New England. Increasing moisture associated with a new push of reinforcing warmth will bring clouds Thursday night with northern New England showers, then occasional showers for all with highs in the 50s for most and 40s north on Friday. As mild air continues to fight its way into New England from the south, the temperature battle zone creating showers will slowly migrate north, landing in northern New England on Saturday while southern New England stays mostly dry. 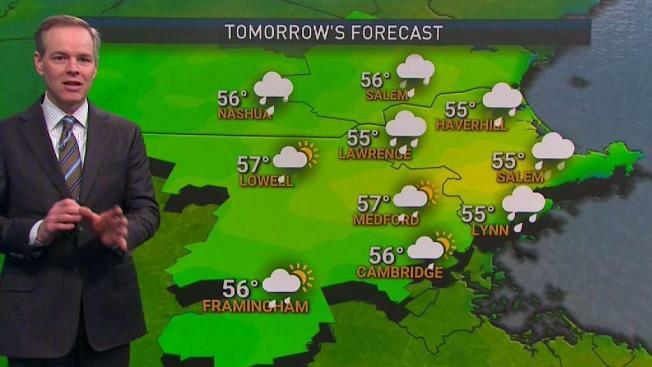 The southern part of the region only has a 30 percent chance of showers, according to our exclusive NBC10 and necn Forecast System. An approaching cold front from Canada will carry Saturday’s North Country showers are south, so Sunday brings showers for most of us and probably enough cold air behind the front for some snow to fly in the North Country! A shot of cool and dry air from Canada is expected early next week, before another chance of showers midweek and late week in our First Alert 10-day.